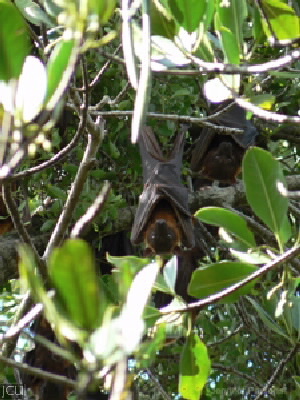 The little red flying fox gives the impression of very nervous and they appear to cluster together for safety. Often fly low to the ground and bodies may be seen caught in fences. They are nectar feeding bats and important pollinators. Body is reddish to light brown; head may be grey, yellowish patch on back of neck; wings pale appearing almost transparent in flight.